Our Exclusive Design for Big Dogs! Adorable nurse costume with nurse's cap. 100% cotton and fully line trimmed in red with red tulle underlay. Our nurse pup can make everyone feel well and happy! A great costume for Therapy dogs, Halloween or any care-giver who gives joy and comfort to two-legged creatures. The dress and hat are made of easy care cotton with cotton lining for your pet's comfort. A red heart and white cross are appliqued on the dress and hat. The dress closes at the neck and waist with sturdy Velcro. Handmade Allow 2 weeks to ship. Now available for the large dog is our Dr Barks Dog Coat Costume. This Coat/Costume can also be used for large Therapy Dogs. Made with white cotton or cotton/poly. Top and lining are same fabric and has a lined white collar. Tummy and neck tabs with hook & loop closures (velcro). Coat edge is top-stitched to help hold the coat shape. Costume has a red cross in lower left hand side/back of coat, made from red felt and machine stitched onto the coat. A pocket that has a pen & tongue depressor is on the lower right hand side/back of the coat. Special stitching on the pocket top to help hold in the pen & tongue depressor. The name Dr Barks was written on with a permanent fabric maker. A disposable lightweight stethoscope is attached with white ribbon at strategic points to secure it to the back of the coat (picture currently shows thread-stitching holding the stethoscope on). The ribbons will allow removal/re-attachment of the stethoscope for washing. The tongue depressor and pen are also removable for washing. Washing instructions: machine wash cool, no bleach, tumble dry low, low iron if needed. 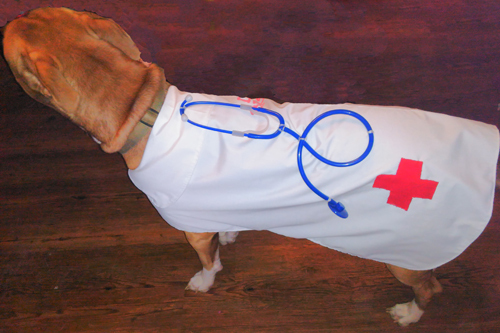 We hope you & doggy enjoy your new Dr Dog Costume. Some minor assembly is required, but these are the same items you would remove for washing. ​Below are pictures of how your assembled Dr Coat should appear, as well as pictures showing how each part of the stethoscope is attached. Some extra wrapping around the stethoscope in 2 places will help keep it in place. The stethoscope comes in 2 pieces. Just gently push the flexible hose over the hard plastic neckpiece. Place the Wood Stick into the first opening at the top of the pocket. There is some stitching to keep it in place in the pocket. Then place the pen into the second opening, using the clip to help secure the pen into the pocket.